After a long week of day trips and delicious meals, Mom and I decided to go out with a bang. 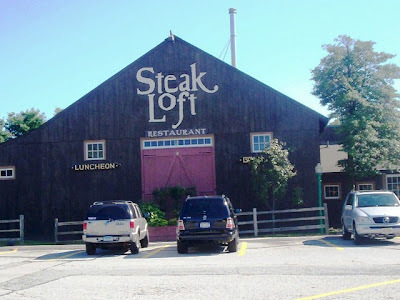 We headed toward Connecticut for a day of gambling at Foxwoods Casino, but not before having lunch at The Steak Loft. The Steak Loft came highly recommended by my aunt, and after reading the menu online, our mouths were watering over the thought of delicious steak. Mom and I pulled into the parking area at just around 3 p.m. The Steak Loft is larger than we thought. There are several dining areas including a beautiful bar at the center of the restaurant. When we entered, a friendly hostess told us that we could sit in the lounge or at the bar. Since we had been in the car for quite a long time, Mom decided to use the ladies' room right away while I chose a seat in the raised lounge. A waiter named Charles came over to introduce himself and bring over two menus. I ordered two Diet Cokes, which promptly arrived in real glasses. When Mom joined me at the table, we took a moment to look over the menu. Charles soon came over to take our order. 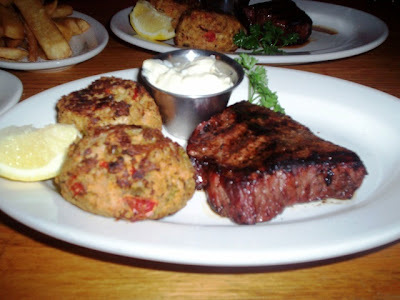 We both ordered the steak and crab cakes combination plate ($22 each). Yes, it is that kind of restaurant. A little on the pricey side, but we wanted to live dangerously. Our meals also came with a potato choice (I chose redskin mashed potatoes and Mom chose steak fries) and a salad with our choice of dressing. When the salads arrived, Mom and I were pleasantly surprised. This was no side salad. It was almost a meal! It had all the basic vegetables, but included some large pieces of meat and cheese. It was almost like an antipasto, and we both enjoyed the fresh salads very much. Even Mom, who is not that into salad, was eating it up. I ate mine so fast that I forgot to take a picture of it. Sorry. The interior of The Steak Loft is quite cozy. It is on the dark side, which made for difficult picture taking. Covering the walls and rafters were various license plates. Surrounding the lounge was a large banquette with very comfortable pillows. Made up of mostly tables and chairs, I did see some booths toward the far side of the restaurant. 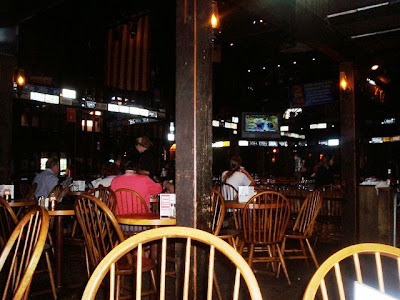 Mounted by the bar was a Plasma TV, and hanging above the diners was a large American flag. It is the perfect restaurant to have a quiet dinner with your loved one, or gather a group of friends and have a celebration. We hadn't been waiting long before our meals arrived. Both dishes looked fabulous. This was Mom's first time having a real steak in a real steak house. Later in the evening when we told my father where we'd gone for lunch, he said to my mother, "So ... you had a steak? You had a steak?" Whichever word he emphasised didn't help him get over the fact that my mother sat down and had a piece of meat at a restaurant. She has always been nervous to order a thick piece of meat for herself because she was afraid that it would taste "weird" or chewy. However, she was very happy with her choice. The piece of meat on her plate was cooked just to her liking (medium well). It had beautiful grill marks and was moist and tender. The portion was perfect and went well with the accompanying crab cakes. The cakes were chock full of crab meat and minced vegetables, which gave them a great taste. They were nicely spiced and had a tasty, crisp coating. I completely agreed with Mom - this was a perfect meal. Even my redskin potatoes and Mom's steak fries were tasty. We may have paid $22 per plate, but we were certainly presented with a lot of food. Tasty food. The Steak Loft has a lot of tasty options such as skewered beef, seafood and meat combinations, sliced steak, barbecue chicken, cod, teriyaki ribs, sirloin, baby back ribs, Filet Mignon, stuffed sole, rib eye steak, New York strip, and various appetizers and "quick bites," which are sandwiches and salads that you can grab in the lounge or at the bar. The prices range from $6-30, depending on what you order. However, please note that the menu online has not been updated. 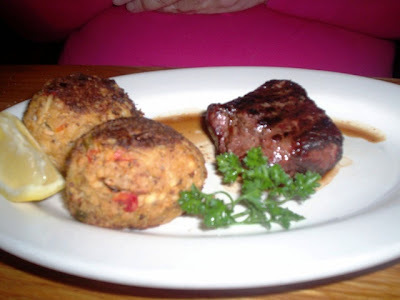 It states that the crab cakes and steak combo is $20.50, which is not true. It is now $22. We left $60.35 on the table, including a 20% tip for Charles, who was in for a rough time with the table next to us. It was filled with pretentious parents who dragged their young son to the restaurant to celebrate his birthday. The Steak Loft is definitely more of an adult restaurant, so we're pretty sure that the poor kid would have been much happier at Chuck E. Cheese's. As Mom and I sipped the last of our sodas, we heard the table complain about not being able to access the salad bar before 4 p.m. They were getting a little irate, so we started to feel really bad for Charles. I hope they weren't too much for him. Before we left, we used the restroom and, like before, it was clean and organized. However, this time around it was filled with drunk old ladies! It's always something. I am so glad that Mom's first experience eating real steak at a steak house went extremely well. She's really beginning to come out of her "I only eat pasta and coffee ice cream" shell and has been trying different things. The Steak Loft is definitely a place that we would visit again, perhaps after a big win at Foxwoods. I wish I could report that we won back the money I'd spent on the meal, but alas, we left there broke. Still, it was a great ending to a superb vacation. The Steak Loft is open from 11:30 a.m. to 9:30 p.m. Monday through Thursday, 11:30 a.m. to 10:30 p.m. on Friday and Saturday, and 11:30 a.m. to 9:30 p.m. on Sunday.